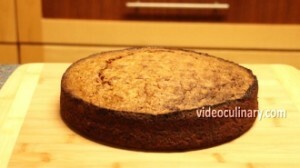 This cake is incredibly moist, delicious and healthy. Use butternut, buttercup, pumpkin, acorn or other types of squash. Grate 300 grams (10 oz) of squash. 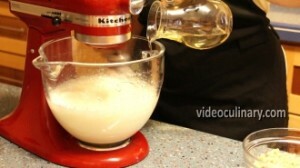 Whip 3 eggs and 300 grams (10 oz) of sugar until thick, about 8 minutes. 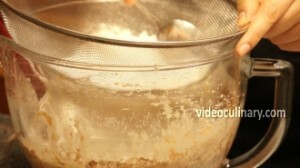 Gradually add 150 g (5 oz) of vegetable oil, whipping on high speed. 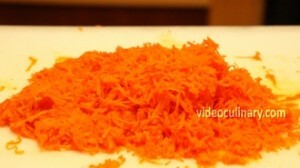 Add the grated squash, 100 grams (3.5 oz) of chopped walnuts, 5 grams of ground cinnamon and ½ teaspoon of salt, and fold. 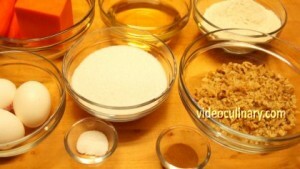 Mix 200 grams (7 oz) of flour with a flat teaspoon of baking powder and sift over the batter. Fold until combined. Pour the batter into a 24 cm (10 inch) cake pan lined with parchment paper. Bake at 180°C (350°F) for 40 minutes. Test for doneness: an inserted skewer should come out clean. Cool the cake in the pan for a few minutes, then unmold and cool completely. Slice the cake in half. Make the cream: Whip 400 ml (14 fl oz) of heavy cream (min 30 % fat) with 50 grams (2 oz) of sugar and 10 grams (2 teaspoons) of vanilla sugar, until stiff. 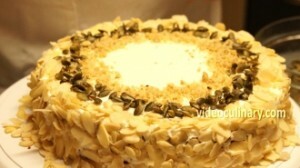 You could fill the cake with cream cheese icing instead. Assemble the cake: Place one cake layer over a serving plate. 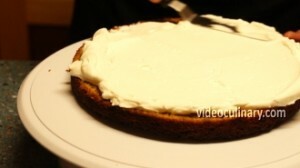 Spread half of the cream over it, and place the second cake layer on top- flat uncut side facing up. 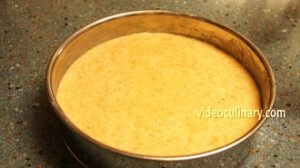 Spread the remaining cream evenly over the cake. Garnish with toasted pumpkin or squash seeds, chopped walnuts and slivered almonds. 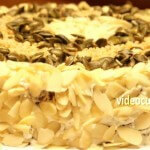 Serve this delicious, moist and healthy cake with tea or coffee! 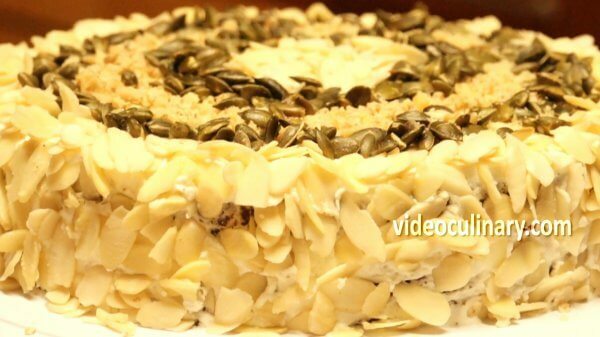 Visit our website for a carrot cake recipe, easy apple cake (Sharlotka), lemon poppy seed cake and more easy to follow recipes!